Can we have our blue skies back? Please? You don't need a chemistry degree or expensive monitoring equipment to tell when the pollution is bad. When the view from the window shows the harbour shrouded in a smoggy haze, you know that whatever is in the air can't be good for us. But how do you tell if it is getting better or worse? If you've lived here long enough to look back five years or more, you'll definitely know things have got worse since then. But it's harder to tell if pollution levels are still rising, or we are starting to see signs of improvement. Enter the Batgung Smog Index, the BSI. It's based on the simple approach described above – looking out of the window. We've taken the 'hours of reduced visibility' records published by the Hong Kong Observatory, and done some simple maths to give an easy to understand number. You can get the full description of the calculations here, but simply put, the more hours of smoggy weather there are, the higher the index goes. The index is set so that the level for October 1989 is 100. No great scientific reason for choosing that date, it just happens to be the month I first arrived in Hong Kong. We're nearly 20 years on from then, so what do you think the current level of the index is? The latest figures from the observatory set the April 2008 BSI at 436. That means we all have to put up with over four times as much smoggy weather each year as we did in the late 1980's. 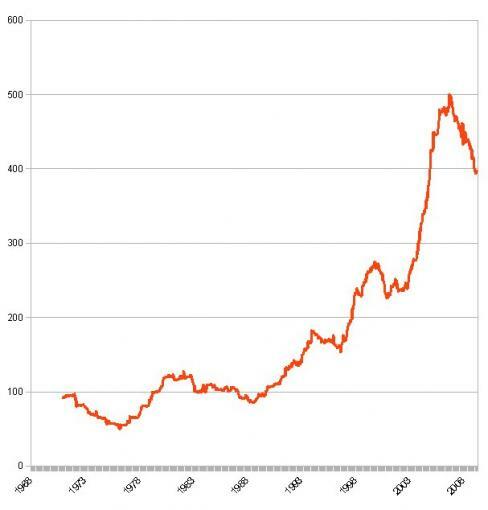 Here's the chart of the index from the early 1970's until April 2008. The level rises and falls in the 1970's and 80's, but from the 1990's it starts climbing rapidly. 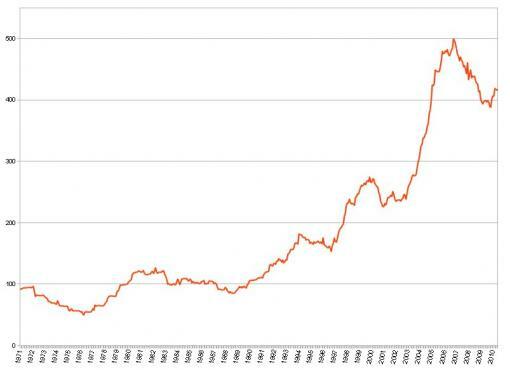 From 100 in Oct 1989 it crosses 200 in Oct 1997, 300 in Dec 2003, 400 in Jan 2005, and peaks at 499 in Oct 2006. Encouragingly the level has fallen since then, but it isn't clear yet if it's the start of a long-term improvement, or a temporary reversal like we saw around 1995 and 2001. We'll have to watch the index to find out - we'll update it as the observatory releases new figures. Any guesses how long we'll have to wait before the index hits 100 again, and we get our blue skies back? 2% better than three years ago (446). June's month of rain means a good reading on the visibility figures. Partly because the rain helps clear the air, and partly because readings are only taken 'when there is no fog, mist, or precipitation'. 2% better than three years ago (447). I've read several reports of the problems companies in southern China are facing (rising wages, new labour laws, global economic slowdown), leading to factories closing down. Not good news for Hong Kong's businessmen, but could the silver lining be a reduction in the amount of air pollution blowing our way? Here are the figures for the last three months. 3% better than three years ago (446). 6% better than three years ago (453). 8% better than three years ago (464). 14% better than three years ago (479). At first the figures seem to back up recent comments that the skies have been clearer in recent weeks than they have for a long time. A word of caution though, November last year was actually clearer than November this year (58 hours of reduced visibility this November, against 38 hours for Nov 2007). Then that clear November was followed by the smoggiest December on record, with a miserable 305 hours of reduced visibility in Dec 2007. Fingers crossed that the clearer skies last into December this year. 13% better than three years ago (475). For the whole of 2008, there were 1,100 hours of poor visibility recorded, the lowest annual total since 2002. 16% better than three years ago (476). 17% better than three years ago (480). The last time the index was under 400 was December 2004. 18% better than three years ago (478). 18% better than three years ago (482). Thanks for keeping track of this - any chance for an updated graph to show the improving trend for the past year? 16% better than three years ago (475). Here is the updated graph of the BSI, showing readings up to May 2009. 15% better than three years ago (472). 17% better than three years ago (475). 17% better than three years ago (481). 18% better than three years ago (484). A smoggy December means we end 2009 with the BSI above 400 again, and little changed from the start of the year. Is this the level of smog we'll have to learn to live with, or will there be further improvements? 22% better than three years ago (499). 22% better than three years ago (497). 18% better than three years ago (491). 16% better than three years ago (483). 14% better than three years ago (475). 11% better than three years ago (471). 10% better than three years ago (464). Smog index update - take deep breaths in July! July is by far the best month of the year for air quality - so breathe deeply, and maybe fill up a few dustbin-liners worth of fresh air now to tide you over the smoggy winter months. Though winds from the south mean low readings every June & July, the Batgung Smog Index (BSI) averages readings over three years, to ignore short-term changes. Here are the readings for May and June, then the annual update to the graph. The graph brings bad news, it shows air quality improvement has stalled. 11% better than three years ago (470). 10% better than three years ago (465). Zero hours of reduced visibility in July! Unfortunately it has little effect on the BSI, as this time of year always has the cleanest air. 10% better than three years ago (462). After zero hours of reduced visibility in July, it looked like we were onto something good, with a better than average figure for August, and the cleanest October air since 2000. But then there was last month, the smoggiest November on record. Here are the updates for August to November. 8% better than three years ago (454). 11% better than three years ago (456). 10% better than three years ago (450). Last month seemed specially smoggy. The Obervatory's figures confirm it was the smoggiest August on record. 6% worse than three years ago (399).